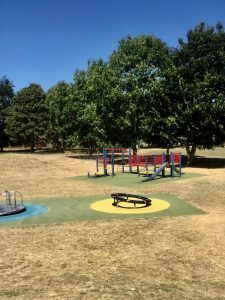 The park is a large green space, and a focal point for the community, popular with local families and dog walkers surrounded by woodland and paths to the Stour Valley. Sports enthusiasts have opportunities including petanque, tennis and adjacent football pitches. A community centre and The Shack youth centre serve the local community. A modern, spacious and grassy playpark for children of all ages with swings, slides, roundabout and playset, each surrounded by appropriate soft surfaces. Next to the playpark is a zipwire.